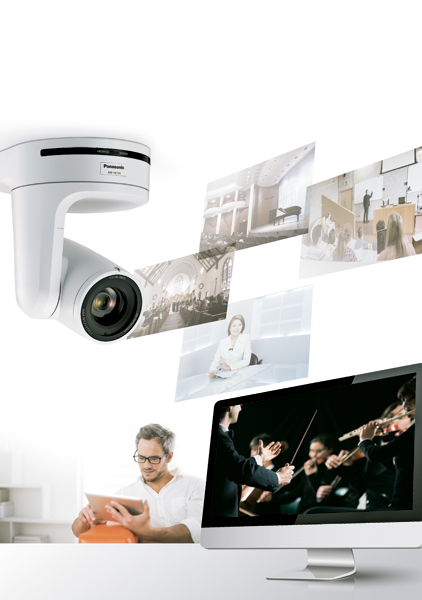 Introducing a new PTZ camera capable Production Quality Full HD video output up to 1080/60p via IP transmission, in addition to 3G-SDI and HDMI. Equipped with three newly developed 1/2.86 MOS sensors for high sensitivity, a superior S/N ratio and high resolution. The AW-HE130W/K also supports PoE+*, so the camera only needs one LAN cable for its power supply, control and video output. Presenting the new standard in versatile, high-quality remote production with 3G-SDI, IP-Streaming, and POE+. *Abbreviation of Power over Ethernet Plus. 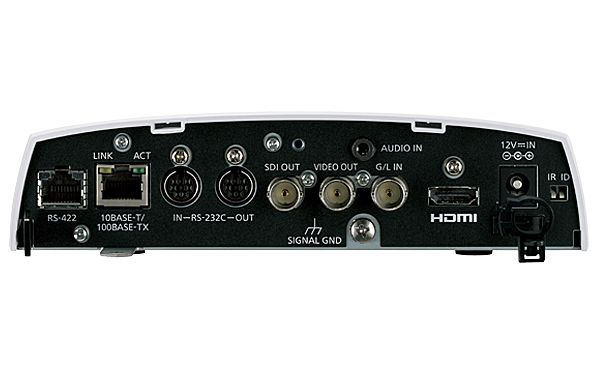 In addition to 3G-SDI and HDMI output, production quality full HD video output via IP transmission is supported with the AW-HE130W/K. The camera delivers up to four channels of IP streaming video (H.264), with a maximum quality level of 1080/60p at 24 Mbps*1. Simultaneous transmission to as many as 14 devices is also supported. *2 Flexible system setup is possible to meet various application needs. 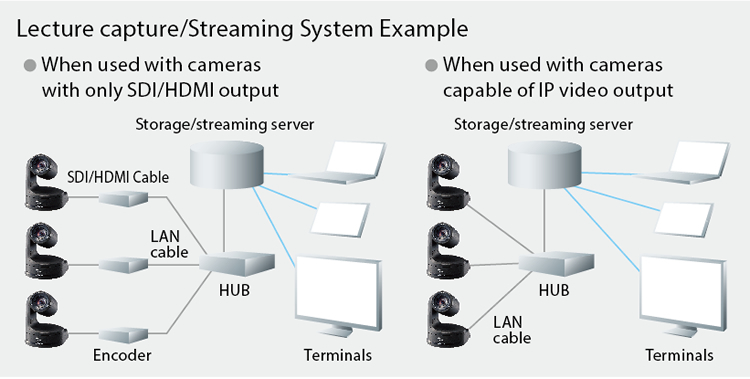 There is no need for the separate encoder normally required when streaming video and audio via IP. Systems can be built with exceptional cost/performance benefits. By connecting to network devices that support the IEEE 802.3at POE+ standard, power can be supplied via LAN cable. Since it is not necessary to install a power supply or even a local A.C. outlet, installation costs can be significantly reduced. Using an IP browser, such as Internet Explorer or Safari, it is possible to set up and control the camera from a remote location. This feature simplifies the management of cameras around a campus, or across a worldwide enterprise network. IP video monitoring and remote camera control can also be performed from mobile terminals such as an iPhone, iPad or Android device. * For the latest information on supported OS/brower, please refer to the "Supported OS and Web browser". 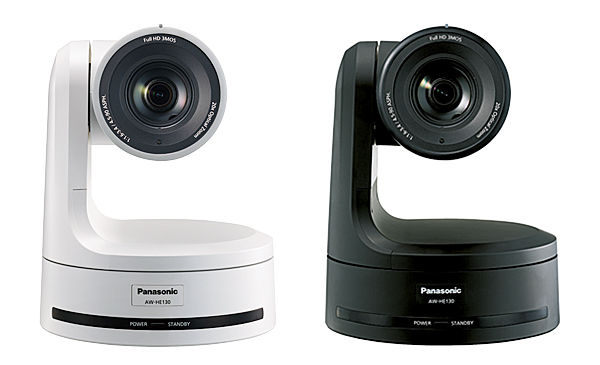 Up to 100 × AW-HE130W/K cameras can be controlled via IP from a single AW-RP120G, AW-RP50, or PC. An AW-HE130W/K can also be simultaneously controlled by up to five AW-RP120G or AW-RP50's via IP. AK-HRP200G can be used for precise color adjustment. *1: 1920 × 1080 60 fps output is 1ch display only. For 2ch or more, display is max. 30 fps. Also, JPEG output is up to 3ch. *2: The number varies depending on distribution settings or network environment. Only one Android™ device can be connected to one camera. *3: Abbreviation of Power over Ethernet Plus. *4: Controller upgrade required. For details, please refer to the "service and support".